This Wednesday we’ll have our pub night at The Famous Warehouse. There are several good reasons to show up for this pub night. The food is not only great but also very cheap. Take a look yourself here. You’ll be able to get good food for just 4.95$! As you can see on the menu, The Famous Warehouse offers nice salads, great tortillas, delicious burgers (of course) and mooch more. Also, it’s a chance to have a little celebration as someone will soon turn 27… guess who. And it’ll be your last cha nce to sign up for laser tag. If you didn’t have the chance to join our stand up paddling activity last Saturday you’ll also have the opportunity to hear a bit about this fun experience. We’ll meet at 6pm at 989 Granville Street which is only five minutes walk from Vancouver City Centre Station. You can sign up for the pub night here. It’s weekend again, and time to get out and experience some of the various great activities that Vancouver has to offer. But you might ask yourself… well here’s a couple of suggestions to help you out. On Fridays the Rio Theatre offers you the cool opportunity to experience or perhaps reexperience good old movie classics/cult movies. This Friday, September 5th, the Rio Theatre shows the good old action packed Terminator 1 and 2 movies. The doors open at 8:45pm and the first movie starts at 9:15. The second movie starts at 11:30pm and the doors open at 11:00pm. You can of course also choose to watch both movies. A single ticket is 8$ at the entrance but you can get it for 6$ if you purchase it in advance. A double ticket cost 13$ at the entrance or you can purchase in advance and get the tickets for 10$. Rio Theatre is located at 1660 East Broadway, Vancouver close to Commercial-Braodway Station. Click here for more information on Rio Theatre. 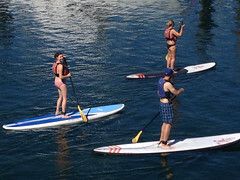 On Saturday you should of course join INTERNeX for stand up paddling at Granville Island. This will definitely be a fun experience! The forecast says awesome weather, so get out and enjoy the sun while it’s here. After a challenging hike up the Grouse grind you might want to do something more relaxing. 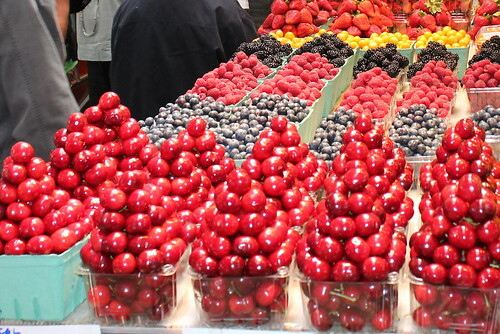 Perhaps you want to be very early with your Christmas shopping this year… Visit the Porto Bello Market. 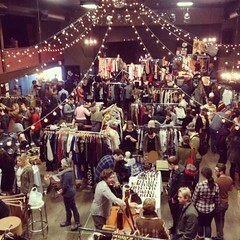 Here you’ll also support local designers, producers and artists. You can also listen to live music while you do your shopping. At the the market you can buy fashion clothing, jewelry, various pieces of art (for instance photography art) etc. The market takes place in Creekside Recreation Centre in the Olympic Village. You can get more information about the market here. Hope you’ll all have a nice and enjoyable weekend, and don’t forget to sign up for the dodge ball tournament happening on Monday, September 8th. You can sign up through Facebook here. 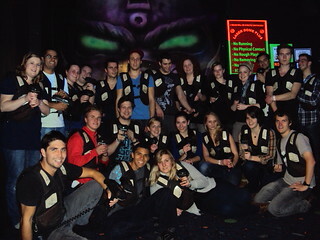 Also remember to sign up for our fun and exciting laser tag event here. Only one more week left in April and we have still our weekly PuB NiGHT on Wednesday the 30rd of April and of course our After Rockies Party. For the month May we have some awesome things planed just for you guys such as Laser Tag, a awesome Mexican Party, Summer night market, PuB & Club night and a Bike ride in Stanley Park. Of course we have our monthly Overnight-Trip. Do you like action? Fight together with your team against the others to be the NO.1 Shooter. 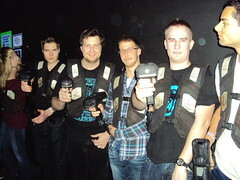 We are going to do Laser Tag on Saturday the 3rd of May. You get a Special-Jacket and a Laser-Gun and than there is only one thing to do:Shoot everybody from the other team who is crossing your way! 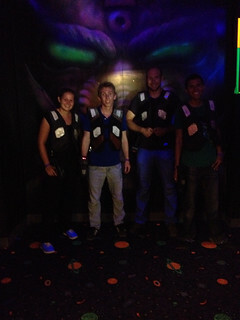 It’s like Paintball but it doesn’t hurt because you shoot with laser and not with bullets! So everybody who is afraid of getting hurt, that’s your chance to have lots of fun and you won’t have black and blue marks the next day! On Monday the 5th of May we will join a Mexican Party called CINCOdeMAYO in the nightclub Republic on Granville Street. There is a live Mariachi Band and the ticket also include one drink. 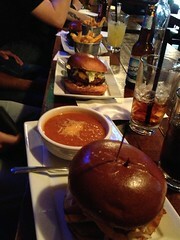 Also their having drinks specials around $3.50. The tickets for the entrance will cost only for us $10 (normally $12). Let’s go crazy on the special day for the Mexicans. Asian-style summer night markets are a summer tradition in Vancouver. On Friday the 9th of May we will visit the summer night market in Chinatown to eat tasty food from over 80 vendors, buy cheap sunglasses and phone cases, go on carnival rides and enjoy live dance and music performances! If the weather will be bad we will have another option for you on this Friday. We are planning a 3-Days-Trip to Tofino. The trip will be on Saturday the 17th(morning) till Monday the 19th of May. You will have the day off on Monday because it’s Victoria Day. 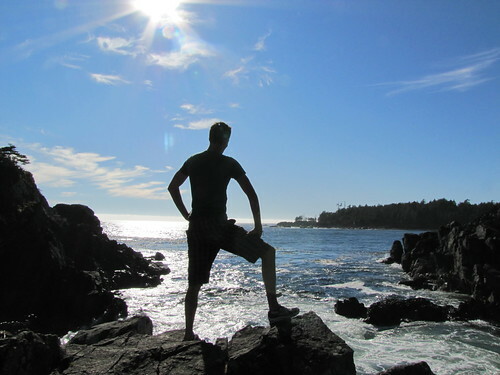 Tofino is a popular tourist destination and famous for the beaches, surfing, whale watching and fishing. On the tour we will take the ferry to Vancouver Island and on our way to Tofino we will visit the Englishman River Falls, Coombs market, Roy Henry Vickers Art Gallery, hiking in the Wild Pacific Trail. Also you have of course the option to go surfing, whale watching, bear watching or kayaking. Get ready for our big bike ride in Stanley Park on Saturday the 31st of May. 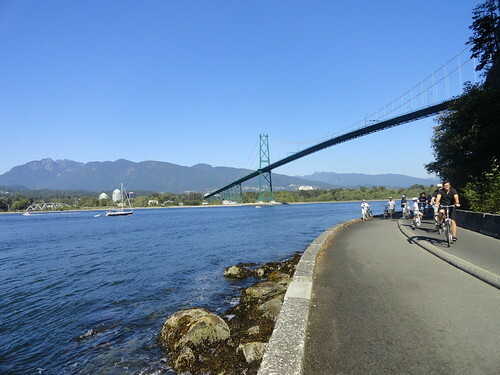 We will rent bikes (or bring your own) and spend the afternoon cruising around Stanley Park! Let’s hope it will be a sunny weekend and we do some outdoor activities to enjoy Spring. 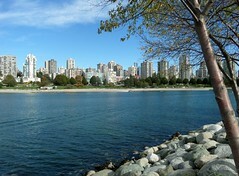 We can bike the 9km-Stanley Park section of the Seawall right on the edge of water and discover there a lot of things. We hope we will see you all guys this Saturday for our After-Rockies-Party! So another week goes and November will finish soon! It’s time to know what has happened during last days! 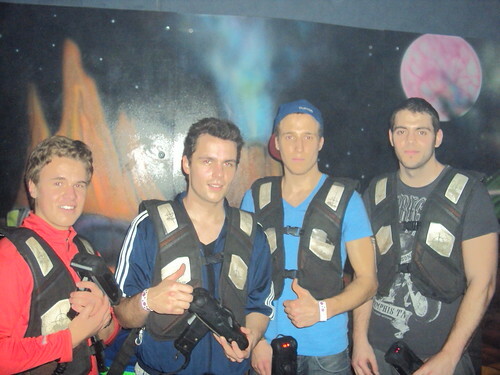 But first of all, remember that tomorrow we have a date (uhh) to play Laser tag! Let’s battle like there is no tomorrow! Last Sunday we went to watch a real hockey game! Exciting for the most of us, because was our first time, not that exciting for the Swedish… haha but anyways we had a good time together! Christmas time is almost here…. do you want to receive a super special gift? Check our contest and you would be able to win a ski rental with 120 dollars of value in Whistler! Send us a picture of Christmas in Vancouver with a special meaning for you and the best picture will receive the prize! 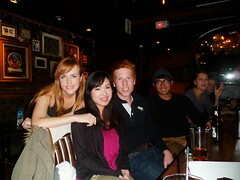 And what about our Pub Night? 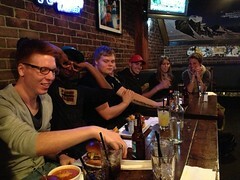 We went to The Morrissey Pub on Granville Street, it was such a nice place, and we enjoyed a few drink s and good company, read our blog post to know more!